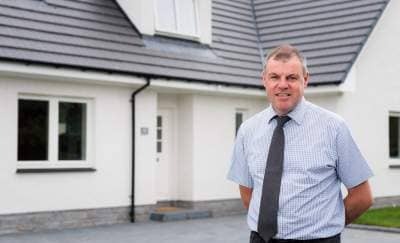 A Stephen Site Manager, who has just completed a 17 year stint at the firm’s development in Scone, is settling into his new ‘home’ at Clathymore, by Gleneagles. Award-winning Alan Robertson, who recently secured the 15th ‘Pride in the Job’ award for ‘Balgarvie’, joined the firm as an Apprentice at the age of 16. The team arrived on site at Balgarvie in Scone in 2000, with only one property now remaining available for sale. Having received his latest National House Building Council (NHBC) award in September, Alan will represent Stephen at the Supreme Awards Gala in London this week, on Friday 26 January 2018. In the meantime, Alan is settling into his new workplace at Clathymore, where he is responsible for the stunning properties within this flagship development, including the Control Tower which the team is currently converting from a disused airfield control tower into a spectacular and wholly unique home. This amazing property is now available for sale – please visit www.clathymore.com for more information. Although Clathymore is a ‘different ballgame’ for Alan, not just in terms of the location but also the difference in house styles and specifications, what’s actually changed for Alan? “It’s a big change after being at Scone for so long. We are using different materials and the properties are very different from those in Scone but, in essence, Stephen is about creating fantastic family homes and that remains at the heart of what we do each day. Irrespective of the sales value of the property, it’s my job to ensure the same attention to detail is given by all of the tradesmen, from electricians, plumbers and bricklayers to painters and forklift drivers. We are a strong and motivated team and our objective remains the same wherever we work – ensuring that everyone is delighted with their new home”. Of course, another important aspect to Alan’s job – whichever site he is managing – is dealing with the individuals and families who have chosen to make the development their home. For more information, please telephone 01738 620721, email sales@stephen.co.uk or visit www.stephen.co.uk.